We’d love your help. Let us know what’s wrong with this preview of The Way of the Shield by Marshall Ryan Maresca. Dayne Heldrin always dreamed of being a member of the Tarian Order. In centuries past, the Elite Orders of Druthal were warriors that stood for order, justice, and the common people. But now, with constables, King's Marshals, and a standing army, there is little need for suc The first novel in the Maradaine Elite series blends fast-paced high fantasy and political intrigue. To ask other readers questions about The Way of the Shield, please sign up. The Way of the Shield is the first installment in author Marshal Ryan Maresca's Maradaine Elite series. The fourth series of the Maradaine universe tells the story of Dayne Heldrin, an elite warrior and protector of the city of Maradaine. This is a series set to the back drop of high fantasy, which means lots of characters, political machinations, with the introduction of the grand ten, as well as plenty of action, magic and adventure. A great addition to the Maradaine world, this book is also pretty satisfying on its own. Maresca has invented a complex political bureaucracy for his characters to get stuck in and/or run up against. In the case of this book's particular (and new) main character, Dayne, a sort of Knight-in-Training who is so morally upright as to be a pillar, the bureaucracy becomes such an obstacle that it's like a character in itself. The crux of the matter is basically how Dayne and co. handle it, versus how A great addition to the Maradaine world, this book is also pretty satisfying on its own. Maresca has invented a complex political bureaucracy for his characters to get stuck in and/or run up against. In the case of this book's particular (and new) main character, Dayne, a sort of Knight-in-Training who is so morally upright as to be a pillar, the bureaucracy becomes such an obstacle that it's like a character in itself. The crux of the matter is basically how Dayne and co. handle it, versus how the ostensible Bad Guys handle it, and how easy it can be to manipulate people. Especially when they feel they've been wronged by a political system. Parallels to real life, anyone? I’ve greatly enjoyed all of the other Maradaine series that Mr Mareska has written and had been waiting for his new one to drop with baited breath. I was not disappointed. While the bulk of the book is broken in to finding a place for an order of paladins in a more urban and sophisticated society, the remainder focuses on the conspiracy to do away with Druth’s nascent democracy and return to the good old days where the nobility could do whatever it wanted. And we’ve seen some early pieces of this I’ve greatly enjoyed all of the other Maradaine series that Mr Mareska has written and had been waiting for his new one to drop with baited breath. I just seeing connections where there aren’t any? Some of it is a bit subtly hidden, but I feel like this is a book that will benefit from a couple reads before you really feel like you’ve seen all the pieces moving. That’s a bit of a downer for some, but it gives me something to do while I’m waiting for the next book. The blazes, Mr Maresca? This story almost didn't make it to 4 stars in my estimation!!!! For almost 70% of the narrative, we have a main character who is a seemingly insipid mix of Dudley-do-Right and Done-it-Duncan, parked in the middle of a somewhat confusing and almost boring explanation of the Maradaine political system (which is actually rather complex, as it turns out). I had to put the story aside for a bit and read something else, just to give myself a break. However, my faith in this AMAZ The blazes, Mr Maresca? This story almost didn't make it to 4 stars in my estimation!!!! However, my faith in this AMAZING writer's capabilities won through, and when I picked the book up again (with a heavy sigh, I might add), the story COMPLETELY turned on its head and produced political shenanigans worthy of Robert Ludlum and Tom Clancy. Wow, I did NOT expect that oh-so-nasty twist in this tale!!!!!! Maresca continues to produce intricate fantasy. This latest book in Maradaine is the first of a new series and was quite good. We've had a view of Maradaine from the following viewpoints: student/magician's, policeman's perspective and thief. Now we get the military perspective-or maybe the Templar perspective as I think that's the closest analogy we have. As usual, great characterization and lots of surprising reveals and plot twists. I keep thinking I need to go back and read them all in order Maresca continues to produce intricate fantasy. This latest book in Maradaine is the first of a new series and was quite good. We've had a view of Maradaine from the following viewpoints: student/magician's, policeman's perspective and thief. Now we get the military perspective-or maybe the Templar perspective as I think that's the closest analogy we have. As usual, great characterization and lots of surprising reveals and plot twists. I keep thinking I need to go back and read them all in order because I'm sure I'm missing clues to the overarching plot that is clearly woven between all of these books. Storyline had a judicious taste of current events which actually made the plot believable. But I have reservations - I like the make up of Dayne (MC) but do not think I like him. He is a Paladin...almost to a fault. 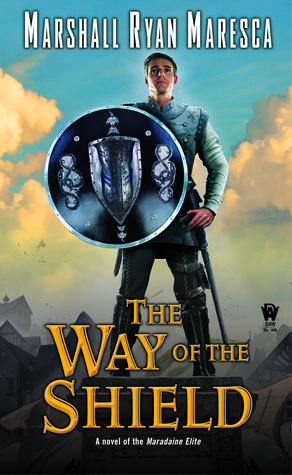 The Way of the Shield is the first book in the final series from Marshall Ryan Maresca.. We've been previously introduced to a vigilante college student, some exceptional if odd constabulary folks, and a crew of misfits from Holver Alley. This book introduces us to the more powerful among the Druthal nation - we meet the Parliament and the various orders of protection for the nation. I enjoyed the Maradain Series, really enjoyed the Maradaine Constabulary series, and loved the Streets of Maradai The Way of the Shield is the first book in the final series from Marshall Ryan Maresca.. We've been previously introduced to a vigilante college student, some exceptional if odd constabulary folks, and a crew of misfits from Holver Alley. This book introduces us to the more powerful among the Druthal nation - we meet the Parliament and the various orders of protection for the nation. I enjoyed the Maradain Series, really enjoyed the Maradaine Constabulary series, and loved the Streets of Maradaine. I wanted to enjoy the Maradaine Elite, but it just didn't hold the same appeal. The Way of the Shield is action packed and full of intrigue and interesting characters, but we don't really get much development of the characters. There is a lot of potential here, but I felt like character development was sacrificed in order to bring the big overarching plot of intrigue. There are even interludes within the book that switch the point of view of events to those ultimately planning to orchestrate a large-scale coup. I realize all of the other books and series were hinting at this, but they did so without rushing. The main character, Dayne, has the affections of two women. But this never seems to come into play for him (though it does for the women - which is frustrating). We don't really know Dayne. I found myself wanting more of the newspapermen than those of the Tarian Order most involved in the book. This author’s books are just plain fun. Multiple interlocking series set in the same fantasy city from different perspectives. They aren’t great classics of literature but I’ve had a good time reading all of them so far and I look forward to the next book. An excellent mix of political intrigue, conspiracy theories, and medieval court action that one expects from a sword and sorcery fantasy novel. I enjoyed it. But it was missing humor. And the big reveal at the end was a huge shock and really out of character for 2 characters, in my opinion. Marshall Ryan Maresca is a fantasy and science-fiction writer, author of the Maradaine Saga: Four parallel series set amid the bustling streets and crime-ridden districts of the exotic city called Maradaine. This includes The Thorn of Dentonhill, A Murder of Mages, The Holver Alley Crew and The Way of the Shield. His work also appeared in Norton Anthology of Hint Fiction and Rick Klaw’s anthology Marshall Ryan Maresca is a fantasy and science-fiction writer, author of the Maradaine Saga: Four parallel series set amid the bustling streets and crime-ridden districts of the exotic city called Maradaine. This includes The Thorn of Dentonhill, A Murder of Mages, The Holver Alley Crew and The Way of the Shield. His work also appeared in Norton Anthology of Hint Fiction and Rick Klaw’s anthology Rayguns Over Texas. He also has had several short plays produced. He lives in Austin with his family.